The temperature outside may still be too warm for my liking, but I'm in a fall state of mind. 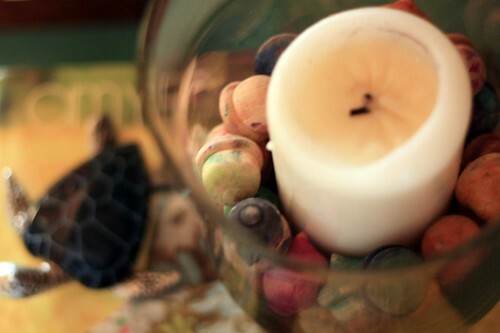 My fall spice candle has been burning while I've been feathering my nest with fall decorations, forcing the season. 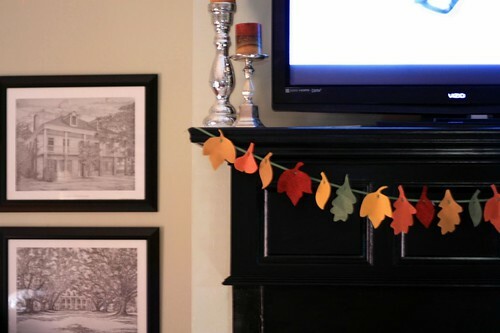 My felt leaf garland has made its annual appearance. I love how it looks against my black mantle. I pulled out the wooden acorns that were painted by my kids a few years ago. Ava must have been too little when we did this because she had no recollection of them and wanted to paint some right now. I may have to hunt some down for her. You can't have too many wooden acorns, can you? This year they found a new home in a hurricane surrounding a white candle. I don't suppose I'll be burning that candle any time soon. And then there are the mums. 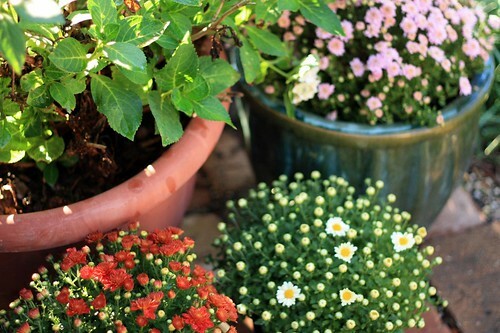 Oh, how I love mums! I focused a little attention to my pitiful patio this weekend, cleaning up all the dead plants, replanting my pots full of mums. What you see above is only a few, there are many more. I'm thinking I need some for the front, too. Now where are the pumpkins? I'm sure they'll be making an appearance soon. All I need now is a crispness in the air. Come on weather, work with me! !